January 1928 issue. See last pic. for contents. Front cover has very light edge wear; second pic. shows small area of white spotting. Spine paper complete, slightly slanted. Rear cover is fine. Amazing Stories was the creation of the father of science fiction, Hugo Gernsback. Gernsback was born in Luxembourg in 1884 and emigrated to the U.S. in 1904. Over the next 20 years he published several magazines for science enthusiasts. Amazing Stories v12n03. Amazing Stories v25n10. Amazing Stories v40n08. Amazing Stories v40n07. Amazing Stories v40n06. Amazing Stories v40n05. Amazing Stories v40n03. Amazing Stories v40n01. AMAZING STORIES: FEBRUARY 1928 ~ BEDSHEET ~ VG+ :: WELLS, VERNE, OLSON, GERNSB. February 1928 issue. See last pic. for contents. Front cover has very light edge wear; wear to left seam. Spine paper complete, lightly soiled. Rear cover has light wear to bottom edge. Overall, about VG . Attributes: Australia - Import, NTSC Region 0. Title: Amazing Stories: Season 2. Video Format: NTSC. Region: DVD: 0/All (Region Free/Worldwide). Format: DVD. New ListingPulp Magazine lot Fantastic Adventures, Amazing Stories, Startling Stories #62 ! Great inside art too with Harlan Ellison and more! Another Amazing Stories from my Uncle's Estate. Also check out the link below to see more Amazing Stories we have for sale! The spine appears to have tape marks. Amazing Stories Pulp - January 1939 issue - "I, Robot"
This pulp is in very good condition. It's complete. "I, Robot" by Eando Binder. The stories are with 146 pages and the pages are light tan and flexible. "Interplanetary Graveyard" by R. R. Winterbotham. AMAZING STORIES: MARCH 1928 ~ BEDSHEET ~ VG :: H.G. WELLS, JULES VERNE, GERNSB. March 1928 issue. See last pic. for contents. Spine paper complete, lightly toned, short separation at top with rear cover. Overall, about VG or VG-. The Amazing Stories February 1929. This is from our Uncle's collection of Amazing Stories. One pen or pencil mark on front cover. Great inside art too with a page by the Great Virgil Finlay and more! AMAZING STORIES Nov 1949 ~ Good Girl Gaudy Art ~ SciFi Pulp Mag in Very Good Condition! See photos for complete details! A quarterly magazine. 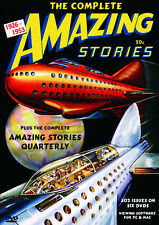 The first issue of Amazing Stories Quarterly was. AMAZING STORIES QUARTERLY. Amazing Stories Quarterly was a U.S. science fiction pulp magazine that was. and Amazing Stories Quarterly; his assistant, T. O'Conor Sloane. Six (6) various Pulp Magazines. Sci-fi Science Fiction short stories from 1950's through 1970's. Imagination Dec 1955. Space Adventures Winter 1970. Analog Aug 1962. Analog Dec 1962. Amazing Stories May 1970. 'ALL HEROES ARE HATED' by Milton Lesser. The book has a short Novelet titled;. `Average(Av); An overall OK cover with pulled edges on more than two sides or missing small corner cover pieces, but still complete as issued just not quite a "Good Issue". Amazing Stories Mar 1943 Pulp Magazine Robot Cover Robert Fuqua Vintage Sci-fi. Shipped with USPS Media Mail. Condition is listed as good. Wear is seen in the pictures. Pages are brittle on the ends but intact. Amazing Stories [v24 #7, July 1950] (25¢, 196pp, pulp, cover byRobert Gibson Jones ). JULY AND AUGUST 1950. ALL KINDS OF STUFF. 40 · The Man in the Moon ·Mack Reynolds · ss. AMAZING STORIES. Amazing Stories [v24 #8, August 1950] (25¢, 196pp, pulp, cover byRobert Gibson Jones ). This is from our Uncle's Collection of Amazing Stories. He collected to collect!